Dear Friends, Today we come with new trick, that will make you shocked. in this you can Make your Computer Welcome You – Like Iron Man’s Computer, We generally see in movies that the PC of the Actress/Actor welcomes him by calling her/his name. So now you can do with below trick. It’s too much easy, You just have to follow process showing below. You also want that our PC? should also welcomes us like them? Believe me friends it is possible…Yes, MyTricksTime Team Found that Trick For You. Navigate to All Programs > Accessories > Notepad. 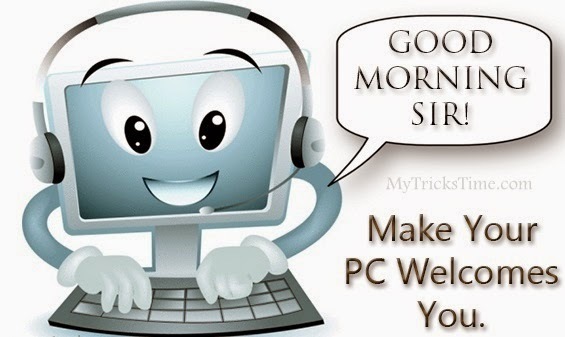 speaks="Welcome to your PC, Rahul"
Replace Rahul with your own name. and save the file as MyTricksTime.vbs name on desktop. Now when the next time you start your computer, Windows will welcome you in its own computerized voice. Now Copy the saved file. If C:\ is your System drive. AppData is a hidden folder. So, you will need to select showing hidden folders in Folder options to locate it. Note:- For best results, it is recommended to change sound scheme to No Sounds, Showing Below. If you wish to save your Previous Sound Scheme, you can save it by clicking Yes in the popup menu. Dear MyTricksTime Lovers, Try it yourself to see how it works. if you ask to me, i’ll say this is an amazing trick. Whenever I start my PC in front of anybody and the PC welcomes me, the fellow is left wondering how brilliant a computer do I have. i hope you like this awesome trick. You can get updates directly via our Facebook page , please like to support us.